Israeli Prime Minister Ehud Olmert, Defense Minister Ehud Barak and Foreign Minister Tzipi Livni met Sunday to discuss an Egyptian cease fire proposal with Hamas, as voters preparered for Tuesday’s elections. The first phase of the deal bokered with Egypt woud mandate a cessation of all hostilities between Israel and Gaza gunmen and would include a Hamas commitment to refrain from firing rockets into southern Israel for 18 months. The second phase would be worked out later and would involve prisoner exchanges. Polls in Israel show the far right leader Benjamin Netanyahu of the Likud Party will be favored by most voters in Tueday’s election. Likud generally takes a hard line against removing Israeli settlements in the Golan Heights and around Israel. The Jerusalem Post also said on Sunday that twice as many lawmakers will recommend to President Shimon Peres that Likud chairman Benjamin Netanyahu form the next government as will back Kadima leader Tzipi Livni. But on the same day at the same conference, Iran’s former nuclear negotiator defended the Holocaust denial statements of Iranian President Mahmoud Ahmadinejad. Pierre Lellouche, a French politician attending the conference, said it is unlawful in France to deny the crimes of the Holocaust. “In Iran, we don’t have the same sensitivities,” countered Ali Larijani, a member of Iran’s Security Council. Meanwhile, Israeli warplanes hit targets in the Gaza again today as Hamas continued smiggling across the border from Egypt. And the United nations stiopped humanitarian re-supply of Gaza, accusing Hamas of looting the supplies for its own uses. Palestinian medical officials say two people have been wounded by an Israeli airstrike in the southern Gaza Strip. Witnesses say the men were wounded while traveling in a car in Rafah, a town near the Egyptian border. Their conditions and identities weren’t immediately known. Monday’s airstrike comes in response to recent rocket attacks on southern Israel. Israel often targets Rafah because it is the site of a brisk smuggling industry. Israel recently ended a three-week offensive meant to halt rocket attacks on Israel and end weapons smuggling into Gaza. The Israeli army had no comment on the reported airstrike. Israeli’s prime minister threatened “harsh and disproportionate” retaliation after Gaza militants fired at least 10 rockets and mortar shells into southern Israel on Sunday, wounding three people and raising the risk of fresh violence days ahead of elections. Palestinian Authority President Mahmoud Abbas said on Sunday that he will not hold reconciliation talks with the rival Hamas group unless it accepts his authority. That may not be easy as Hamas is the elected government of Gaza. Today Abbas discussed the matter with Egypt’s President Mubarak in Cairo. Hamas also has a group of diplomats in Cairo today to discuss the cease fire with Israel. 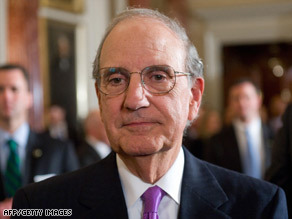 President Obama’s Middle East envoy George Mitchell may travel to the Middle East as early as this week. CNN is reporting that Mitchell the schedule is still being planned, but initial stops include Jerusalem; Ramallah, West Bank; Cairo, Egypt; Amman, Jordan; and possibly Saudi Arabia as well as Europe. President Barack Obama on Thursday named Mitchell as his special envoy to the region. But it is not yet clear how much Mitchell can do to formulate a new policy that will satisfy all sides in the region. In naming George Mitchell as special envoy to the Middle East, President Obama unfortunately made statements indicating no departure from the failing policies of previous administrations. In particular, Obama emphasized Israel’s right to “defend itself,” never once mentioned things like the occupation or international law, attacked Hamas (a duly elected movement that represents a significant portion of the Palestinian people), supported the strangulation of Gaza, demanded no resistance from an occupied people, and supported the Israeli occupiers in their violence that most recently killed over 400 children. This logic has been tried before, including under the “aggressive diplomacy” of Bill Clinton and has yielded only a strengthening of Hamas, weakening of Fatah, continued Israeli colonization on Palestinian lands, and setting the stage for future conflicts. Further, such an approach is even more untenable now after the setback of the June 2006 Israeli war on Lebanon and the current war on Gaza. As articulated well by President Jimmy Carter, it is wrong to frame this conflict simply as “democratic Israel” facing “terrorist groups like Hamas” and it is wrong to continue to fund Israeli wars while claiming to be an “honest broker.” It is analogous to describing the struggles in South Africa in the 1980s as “democratic South Africa” facing off against “terrorist groups like the ANC” (actually that was President Reagan’s framing in his first term in office as he supported Apartheid). Yes, some members of the ANC did use terror (including “necklacing” or burning their rivals alive) but that was miniscule compared to the state terrorism and apartheid they faced. The US cannot be an honest broker so long as the US government continues to…. Arab leaders trying to come up with a plan to rebuild Gaza ended their meeting Tuesday in discord, unable to agree on whether to back Egyptian peace efforts or even set up a joint reconstruction fund for the devastated Palestinian territory. The deep tensions among rival Arab leaders could affect the fragile cease-fire between Hamas and Israel that ended a three-week Israeli onslaught on the Mediterranean strip. The military campaign to stop militant rocket fire left around 1,300 Palestinians dead, according to Gaza health officials, and material damage estimated at around $2 billion. Thirteen Israelis were also killed. The violence in Gaza split Arab countries into two camps — one led by Syria and Qatar supporting Hamas hard-liners who rule the territory, and another led by Egypt and Saudi Arabia hoping to lure the Palestinian militant group toward more moderation. The two-day gathering of Arab leaders in Kuwait that ended Tuesday was expected to announce a fund to rebuild Gaza and a unified statement about how to end the crisis there. Instead, pledges came in vague and without figures, along with criticism for Israel and threats to hold it accountable for what leaders called “war crimes” in Gaza. It remains to be seen when the money will be paid and if it will be delivered to Gaza’s militant Hamas rulers or to the rival Palestinian Authority in the West Bank. Hamas seized control of Gaza in June 2007 from its Palestinian rival, the Fatah movement of Palestinian Authority President Mahmoud Abbas, which now controls only the West Bank. The two groups have been unable to come up with a power-sharing agreement. Shortly before a final statement was read, Iraqi Foreign Minister Hoshyar Zebari, without naming specific countries, said leaders were unable to reach a consensus. “Some are entrenched in their positions,” Zebari told state-owned Kuwait Television. After the summit ended, Arab League chief Amr Moussa acknowledged he was frustrated. “Of course the Arab situation is still troubled and tense … and we need to exert efforts to close ranks as much as possible,” he said. Barack Obama plans to name former Sen. George Mitchell as his Middle East envoy in one of his first actions as the new U.S. president, the Washington Post reported on Tuesday. Mitchell’s appointment could come as early as Tuesday, the newspaper said, quoting unidentified Obama aides. Obama, who will be sworn in as the next U.S. president at noon EST, has promised to engage on the Middle East immediately as president and a choice of Mitchell as special envoy was seen as affirming his commitment to early action. Mitchell, 75, led a commission appointed by former President Bill Clinton to find ways to halt Israeli-Palestinian violence. His 2001 report called for Israelis to freeze construction of new settlements and stop shooting at unarmed demonstrators, and called for Palestinians to prevent terrorist attacks and punish those who perpetrate them. Mitchell is a former Senate majority leader who later led peace negotiations between Catholics and Protestants in Northern Ireland, an effort that led to the 1998 Good Friday Accord aimed at stemming the long-standing conflict there. Obama has declined to comment in detail on the Gaza crisis and other foreign policy issues during the weeks before he takes over from George W. Bush, citing the principle that there should be only one president at a time. With Israeli troops withdrawing from Gaza after a 22-day offensive and having declared a ceasefire along with Hamas, the new administration may want to move cautiously, allowing the Egyptians and Europeans first to pursue their own initiatives. Hamas reiterated its determination to continue its attacks against Israel despite the possibility of an Israeli cabinet decision on Saturday Night to accept a unilateral cease-fire after three weeks of fighting in the Gaza Strip. Sami Abu Zuhri said Saturday that Hamas militants would keep fighting. Zuhri was speaking in Istanbul where Turkey’s Prime Minister Erdogan said this week that israel should not be permitted in the United nations for ignoring UN resolutions. Ghazi Hamdan, based in Gaza said Hamas has a clear vision that includes ending the “aggression,” a withdrawal of Israeli forces, an end to the siege and opening of the crossings. “If any vision does not achieve these things, then we will continue in the battle on the ground,” he said. Meanwhile, Israeli forces pounded dozens of Hamas targets Saturday as the army kept up pressure on the Islamic militant group. And Israel said its cabinet would vote Saturday night on a possible unilateral cease fire. Tonight the Israel cabinet will meet to vote on a cease fire worked out by Egypt, France, Britain and others with input from Hamas and Israel. But key to the cease fire is what Israel really wants: a Memorandum of Understanding signed yesterday by the U.S. and Isreal to prevent the rearming of Hamas by smuggling. For two days Hamas has offered differing versions of its intentions, first agreeing to a cease fire and then rejecting provisions and continuing to send rockets into Israel. Earlier Friday, Hamas’ Syrian-based political chief Khaled Mashaal rejected Israeli conditions for a truce and demanded an immediate opening of the besieged territory’s borders. Mashaal called on all Arab countries to cut ties with the Jewish state during a summit of Arab leaders in Doha, Qatar. Under the ceasefire plan, fighting would stop immediately for 10 days, but Israeli forces would initially remain in Gaza and the border crossings into the territory would remain closed until security arrangements were made to ensure Hamas militants did not rearm. Salam Kanaan, Save the Children’s country director, who is based in Jerusalem, said: “Save the Children is now preparing to go into Gaza as soon as crossings open and the green light is given.